Through the Deluxe Import feature, Gene Construction Kit contains comprehensive features to allow GenBank searching and file retrieval over the Internet with importing directly into GCK. All GenBank features are converted one-to-one to GCK features using a conversion scheme you can customize. The following tutorial illustrates the basics of these features. Images alternate between Macintosh and Windows screenshots. The program works the same way on each platform. First we need to setup the graphic formats we will use when importing GenBank files. Select Tools > Deluxe Import > Conversion Defaults. The Conversion Defaults panel will show how different GenBank features (i.e. allele, attenuator, C_region, etc.) will be mapped to GCK graphic elements. All these are currently set with simple black font and line formats. To help get you started we have supplied more colorful options for GenBank features. To see these, select Tools > Deluxe Import > Restore Conversion Defaults. This brings up an ‘Open’ dialog. Navigate to the main GCK application folder and find the file titled ‘Importing Defaults’, select it and press Open. This will bring up the conversion default as shown in Figure 2.67. The Use column allows you to toggle between a check mark and an x by clicking with the mouse. Only those features that are checked will be transferred to GCK. The second column shows the GenBank feature Name , while the third column (Type) shows how that feature will be indicated within GCK. You can change how each feature will be treated by selecting the feature and then using the Feature menu and the Format menu to change the appearance of the feature in GCK. Under Tools > Deluxe Import > you can Save or restore you choices of conversion defaults. 3. Select Tools > Deluxe Import > Open Sequences File. Choose the tutorial file called gbmam_sample.gbk. You will see Figure 2.68. 4. Note in this figure that there are actually 5 different genes in the single file we are examining. These are listed along the left side of the window in the Entries list. The first entry, BOVNEURXIA, is selected in the figure. The second list, Features, shows all of the features of this particular entry. These are all taken from the GenBank features table. 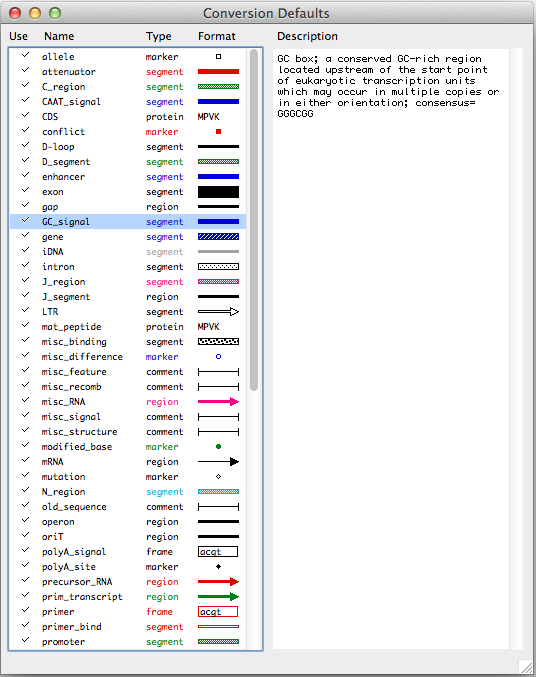 The third column ( Source ) shows the GenBank text that is associated with whatever is selected in the features column. If nothing is selected, as shown here, the Source field shows everything in the GenBank comments. Try clicking on a few Features to see what the associated Source text is. 5. The Location Prefs… button allows you to define how different indicators of position in GenBank files are translated into GCK positions. The Transfer Prefs… button allows you to tell GCK how to handle the transfer of information into GCK. You can take a look at these choices, but for now do not change any of them. Press the Convert To GCK button. This will bring up Figure 2.69. 6. In this window you can see the features, and formatting that has been identified in the GenBank file. To create the resulting GCK file, press the Save Construct to end up with a new construct similar to that shown in Figure 2.70. This figure shows all of the GenBank features that were selected to be imported in the original GenBank file. You can click on each feature and choose Construct > Get Info... to see what that feature is. This entry was posted in gene construction kit tutorials and tagged GenBank Conversion, GenBank Import, Gene Construction Kit, Gene Construction Kit Tutorials, Tutorials. Bookmark the permalink. Post a comment or leave a trackback: Trackback URL.